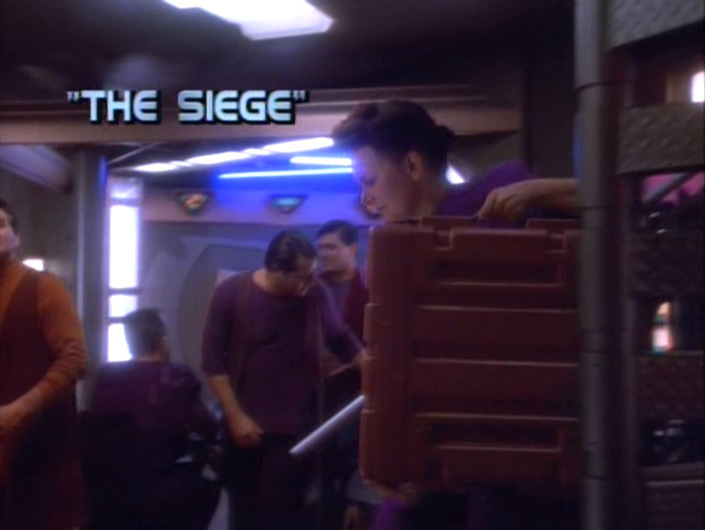 This is a fairly decent action episode, though the holosuite ploy was pretty predictable. It was cool getting to see some Bajoran spacecraft, though Dax was pretty whiny. It’s worth noting that Colonel Day Kannu was played by Steven Weber. The character isn’t developed enough to explain his being so insubordinate. The coup ends when Dax and Kira deliver proof that Cardassians were supplying the weapons to the Circle. Krim says he’ll probably lose his job, but we don’t seem to see any specific consequences for Minister Jaro yet and Vedek Winn plays innocent. I’m not letting either off the hook, though I can’t say for sure if we’ll see either of them again. I think that’s it. Sorry I didn’t have anything too deep to say about the episode. This entry was posted in Television and tagged Bajoran, Cardassians, Day Kannu, General Krim, Holosuites, Jadzia Dax, Major Kira, Minister Jaro, Star Trek, Star Trek: Deep Space Nine, Steven Weber, The Circle, The Siege, Vedek Winn. Bookmark the permalink. Not much of a comment here either.